LAWRENCE, Kan. — The best news of February arrived Monday afternoon. Texas guard Andrew Jones has been released from UT MD Anderson Cancer Center and he will begin leukemia treatments on an outpatient basis. “My doctors tell me I am continuing to show improvement, and that is really encouraging,” Jones said in a statement. Longhorns fans have been anxious for any updates from Jones or the university. A UT-approved fundraiser has generated more than $195,000 for Jones’ family and his treatments. Every Big 12 opponent has worn a pre-game warm-up shirt to support Jones. Kansas players were scheduled to wear shirts with AJ1 printed on the back. The 6-foot-4 sophomore from Irving had five points in nine minutes in the first game against Kansas on Dec. 29. 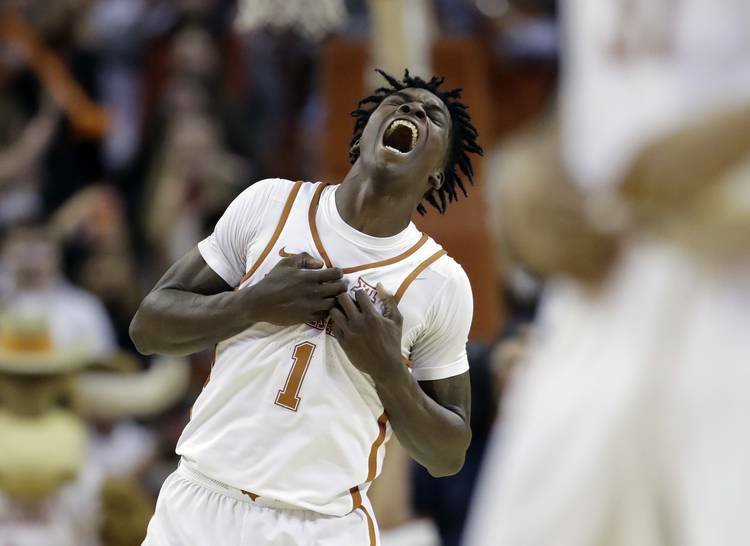 No Bamba vs. Kansas: Texas center Mo Bamba will not play against sixth-ranked Kansas and is back in Austin to stay off his feet. Bamba has been bothered by a left toe injury suffered against Oklahoma on Feb. 17. He played only one half on Saturday against Oklahoma State before sitting down to rest. Bamba had 22 points and 15 rebounds against Kansas in both teams’ Big 12 opener. The Jayhawks sat on the perimeter and hit 17 3-pointers in a 92-86 victory at the Erwin Center. Without Bamba in the lineup, Texas coach Shaka Smart will likely give extra minutes to freshman Jericho Sims and sophomore James Banks III.